Paul Adams is a man of many talents. A crafter of fine instruments, an artist, composer and nine critically acclaimed albums crossing several genres, what can this man not do? 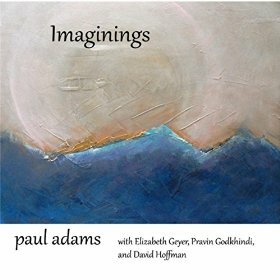 Imaginings is his newest accomplishment and together with the talented musicians Elizabeth Geyer, Pravin Godkhindi and David Hoffman they have crafted an album filled with meditative moments and pure fodder for the imagination just as the title to the album suggests. Instruments used in this album include the guitar, piano, hang drum, Chinese halusi, dobro, electric sitar and flute. The album opens up with the haunting strains of an electric sitar and the winding trails of flute music. Bearing the kiss of a piano, “Just Such Beauty” is a foray into the rainforest of lush musical experience. A buzzing sound denotes life uncoiling all around you as the breathless flute weaves a spell of expectation and bliss. This piece lulls the spirit into another place, guiding you past the trials of the day and into a higher place of spirit and substance. “Giggles and Grooves” is the second piece on the album and is a funny little piece complete with the laughter of children, flute, percussive elements and electric sitar. This song is the bounce and hop of a small child as they play ball with their friends. The skip and jump of a puppy learning first steps. The bubble in your belly of first love. A flower given. A grin on your face as your heart floats as light as the flute playing. Love and laughter live here within each and every note. “Conch Shell by the Sea” is the last piece on the album. Echoes of time slip through the wisps of flute music as they sigh past your ear and into the vast ocean beyond. Piano music creates the waves that swirl and rush past your ankles as you step into the forever ocean. Life is limitless. Your possibilities great and ever flowing as the whisper of the conch spells out the secrets of the universe. “Imaginings” is an album rich with imagery that crosses into the New Age genre and also makes its mark with World Music. Improvisation runs rife through the thought provoking pieces, tangling up the spirit in a maze of lush plant life and effervescent compositions. Melodies hum and spin, carrying the listener deep into the meditative places that promote healing and stress relief. 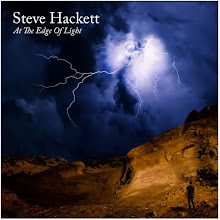 This is a remarkable album and I highly recommend it for some quality sound.